Visit FidelitySignal.com for additional investment strategies. Stock markets around the world dropped again today following a global sell-off yesterday. Observers pointed to renewed worries about the impact of the fiscal cliff and the health of the European economies. The slowing global growth and the potential for the escalation of geopolitical conflicts are also unsettling. Add to that the possibility of another wave of selling of investments before the end of this year to lock in 2012 tax rates, and we end up with a high-risk environment even for conservative investors. As we start to evaluate investment strategies for 2013, it seems that there are not many good choices are available. That is why we like the unique strategy offered by our sister site, FidelitySignal. For more information click here. Will panic selling resume in the stock markets following the Labor Day weekend? No doubt, this is a difficult market to invest in. 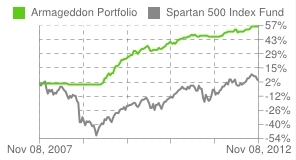 Our favorite model portfolio continues to be the Armageddon portfolio published by FidelitySignal. See their report at http://fidelitysignal.com/aug_2011. 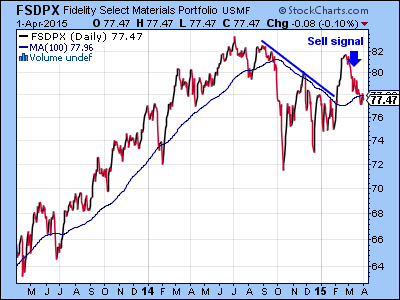 Three days ago we cautioned investors about the continued bearish outlook for the stock market. Today, negative economic reports and renewed worries about the European debt crisis triggered another sell-off globally. We wouldn’t be surprised to see the selling to continue. The Fidelity Spartan 500 Index fund (FUSEX) dropped 4.44% today. The silver lining is that the U.S. stock market has not yet broken below the recent lows, which can act as a support level. Furthermore, there are still a few areas where gains have been made. For example, investors continued to rotate into the safety of U.S. treasury bonds resulting in a 1.68% gain by the Fidelity Spartan Long-Term Treasury Bond Index fund (FLBAX). The Fidelity Spartan Long-Term Treasury Bond Index fund (FLBAX) gained 1.68% as investors continue to rotate into the safety of U.S. treasury bonds.